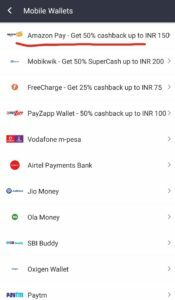 Padmaavat Movies Ticket Offer – Bookmyshow is back with another great offer in which they are giving 50% cashback upto Rs.150 for All Users plus 15% Off Upto Rs 100 on bookmyshow gift cards on Amazon. If you avail both the offers you can get a total discount of Rs 250. So hurry up and avail the offer. 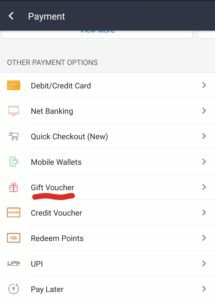 How to get 50% Cashback + 15% Discount on Padmaavat Movie Booking ? 3. 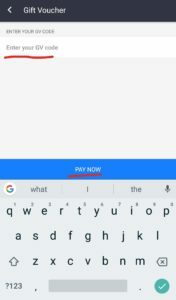 Now Sign-up or Sign-in if you already have an account. 4. Now select your City and the movie. 5. Select your theater timings and the number of Seats. 7. On the Payment Page select Gift cards and enter your purchased Gift card code. 8. 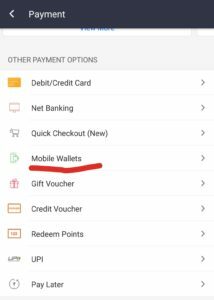 Pay the remaining amount using Amazon Pay balance to get 50% cashback upto Rs 150. 10. You can avail both or any one of the above offer. 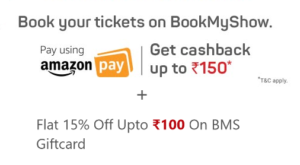 15% discount will be given on purchase of BookMyShow Digital Vouchers (E-Gift Cards) on Amazon India website and mobile apps up to a maximum discount of Rs. 100 per customer.